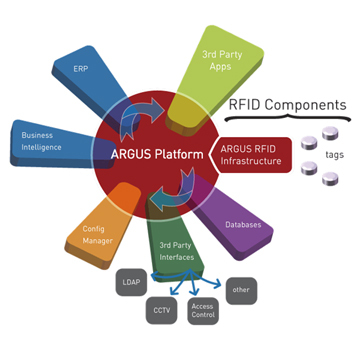 The goal at Argus Real Time Locating System (RTLS) was to create a robust and reliable Active RFID Platform ensure the system software, integration, deployment and maintenance does not drive up your total cost of ownership. RTLS system deployment and maintenance are key cost drivers over time – we designed our affordable Argus platform to acquire RFID tags quickly without data collisions and robust, created customizable RFID tags to fit the application and the overall system to reduce total cost of ownership. The Argus Real Time Locating System platform is the core of our RTLS technology. It is comprised of software, locating algorithms, database management and RFID hardware components. We built the RTLS technology for easy integration, and supply a software development kit and “Test App” to speed integration of third party apps and peripherals. Argus RFID active tags are the other key component of our technology. Built to operate with the Argus RTLS platform, we offer a variety of active RFID tag features and enclosures not only for healthcare but also a multiple of industrial and enterprise applications and use cases. For a more in-depth look into managing assets, people, items and just about anything with RFID technology (click here)!